. 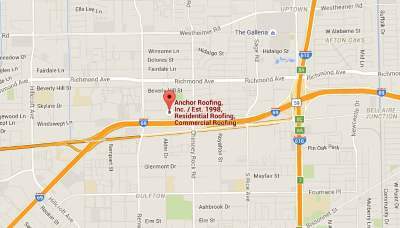 Roofing Safety Houston | Roof Repair Houston | Anchor Roofing Inc.
Safety, our number one priority! In order to clarify the safety activities of ANCHOR ROOFING, INC. of Houston, Texas, the following is set forth as a basic program to clearly establish its existence. We wish it to be known that this program will become a basic part of our management policy and will govern our judgment on matters of operation equally inclusive with consideration of quality, quantity, personnel relations and other phases of our management. ANCHOR ROOFING, INC. holds in high regard the safety, welfare, and health of its employees and contractors. We believe that “production is not so urgent that we cannot take time to do our work safely”. In recognition of this and in the interests of modern management practices, we will constantly work toward the maintenance of safety and healthful working conditions, the consistent adherence to proper operating practices and procedures to prevent injury and illness, and conscientious observance of all Federal, State and Company safety regulations. 1) To provide safe and healthful working conditions to the maximum extent possible. c) Accidents add directly to the Company’s costs. 3) To carry out the Company’s obligations under Federal, State and Local safety and health laws and regulations. Management considers loss control to be paramount duty of all employees / subcontractors and no other consideration should be any more important than accident prevention. Each member of management has personal responsibility for the safety of all employees. In carrying out this responsibility, a Loss Control Coordinator should be appointed and called upon for assistance. Such assistance in no way reduces the personal responsibility of the employees / subcontractors for safety, nor their obligation to incorporate loss control into the equipment and operating procedures under their control. The following actions or considerations are required to create a climate which will permit the continuing and consistent application of the policy. 1) The establishment of a Loss Control Committee, an Accident Review Committee, and designation of the Company’s Loss Control Coordinator. 2) The development and implementation of written loss control procedures issued over the signature of the President. 3) The provision of safety devices and personal protective equipment whenever their use is warranted. It shall be the responsibility of Mr. Victor Kato, Vice President, to review the overall Loss Control Program and to approve actions needed to implement that policy. The Vice President, or his designee, will review recommendations originating from Mr. Bently Fondren (President Operations), Mr. Fred Kirby (Risk Manager/Loss Control Coordinator), Mr. Bill Hubbell (Vice President Production), Employees, Subcontractors, and the Loss Control Committee for final approval or rejection. The Loss Control Coordinator is assigned the daily responsibility of administering and coordinating the Loss Control program for the Company. 1) Developing Company guidelines and establishing goals and objectives in accident prevention, fire protection, industrial hygiene and other environmental areas. 2) Participating in trade associations and government agencies and legislation in the field of loss control which affect the Program development. 3) Participating in seminars, schools and new development in the field of loss control to improve the technical knowledge and in return give better direction to the Loss Control Program. 4) Maintaining a technical library of films, training and visual aids, technical articles, reference books, etc. to directly support the loss control efforts. 5) Maintaining records of accidents and injuries and evaluating such records to determine where and how improvements can be implemented. 6) Providing periodic reports relating to the effectiveness of the Program and developing trends. 7) Advising management in the administration of the overall program. 8) Chairing the Loss Control Committee. 9) Chairing the Accident Review Committee. 10) Maintaining liaison with governmental authorities and insurance representatives. 11) Studying and evaluating loss control standards, regulations and applicable laws. 12) Assisting and advising the Insurance Agent of the inherent hazards and exposures in the company for consideration in procuring insurance. 13) Assisting the Vice President Production and Field Supervisors in conducting safety meetings. It shall be the responsibility of the Vice President Production and Field Supervisors to manage and coordinate the accident prevention activities for his operations. 1) Ensure compliance by employees and subcontractors of the Company safety policies and procedures. 2) Maintain the training activities of employees and subcontractors on a continuing basis. 3) Inspect tools, equipment and vehicles on a regular basis to ensure all are in proper safe operating conditions. 4) See that all employees, subcontractors and vehicles have the proper safety equipment and/or protective devises. 5) See that all vehicle accidents and injuries are reported immediately to Company management and/or the appropriate authorities. 6) Investigate and report all incidents (Near Misses) to the Loss Control Coordinator including suggested recommendations for preventative corrective action. 7) On request, thoroughly investigate each accident, prepare and submit an Accident Report to the Loss Control Coordinator and assist in implementing corrective action to prevent recurrence of the accident. 8) Council with employees and subcontractors on matters pertaining to loss control for the purpose of providing motivation in the Company’s loss control efforts. The Occupational Safety and Health Act require that each individual employee and subcontractor comply with safety guidelines, health standards, rules, regulations and orders applicable to his or her conduct. 1) Perform his or her work safely. 2) Report any unsafe conditions observed in the shop, on job sites or on company vehicles to immediate supervisor. The Loss Control Committee shall be composed of Mr. Bently Fondren (President), Mr. Victor Kato (Vice President Operations), Mr. Fred Kirby (Risk Manager/ Loss Control Coordinator), and Mr. Bill Hubbell (Vice President Production). It will be the responsibility of the Loss Control Committee to review and keep current the Loss Control Program at all times, and to submit to the President any recommendations concerning the program. The Accident Review Committee shall be composed of Mr. Bently Fondren (President), Mr. Victor Kato (Vice President Operations), Mr. Fred Kirby (Risk Manager! Loss Control Coordinator), Mr. Bill Hubbell (Vice President Production), and Field Supervisors. It is the responsibility of the Accident Review Committee to review all accident reports. Training and instruction must be a part of the total loss control effort. All training should be initiated for the purpose of influencing the proper attitude of employees and subcontractors concerning their loss control responsibilities, stimulating employee and subcontractor interests in loss control and providing periodic job instructions. Beginning with the initial orientation program and continuing throughout the term of employment or contract, each employee and subcontractor will be instructed in techniques to insure a safe workplace. Instruction will be in the form of handouts, safety posters, verbal instructions, safety meetings and Company recognition and awards. Instruction will be the responsibility of the Mr. Bently Fondren (President), Mr. Victor Kato (Vice President Operations), Mr. Fred Kirby (Risk Manager/Loss Control Coordinator), Mr. Bill Hubbell (Vice President Production), and Field Supervisors. Management must lead the way in promoting proper accident prevention. Every member of the management team must accept responsibility for creating a safe work place. 1) Practicing all the rules of accident prevention for his operation. 2) Talking about accident prevention to employees and subcontractors on a regular basis. 3) Correcting any unsafe practices which are observed or which are reported to them. 4) Taking firm and immediate corrective action against anyone violating safety rules. Employees and Subcontractors are often a good source of information on ways to improve the safety of the job site. Employees and Subcontractors should be encouraged to notify their field supervisor or a member of the Company management team when he observes any unsafe practice or condition, or when he has an idea for improving the safety of the work place. The purpose of accident investigation is to obtain information necessary to determine the cause(s) of the accident. The findings of the investigators must be reported to the Accident Review Committee on a timely basis and corrective action, if any, must be initiated as soon as possible. It shall be the responsibility of Mr. Bill Hubbell (Vice President Production) and Field Supervisors to investigate every accident, near accident, and injury and to report their findings to the Accident Review Committee. In case of a serious accident/injury, an outside expert professional investigator may be retained, for further accident review, at the discretion of Mr. Victor Kato, Vice President. 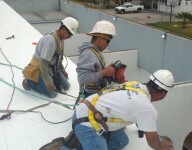 Contact us for roof repair Houston for Reconstruction or any leakage services.